The inherent structure of a book as an object with moving parts means that the stress of use is concentrated in areas. One of the main areas where this occurs is at the joints, especially the upper joint. When the stress gets too much the covering material may split, the sewing supports may break or both of these things may happen. 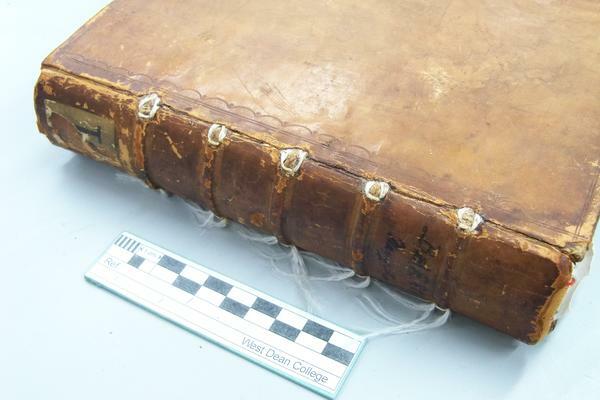 If this happens and the spine piece is still intact this can be a difficult thing to repair on anything other than very small books. 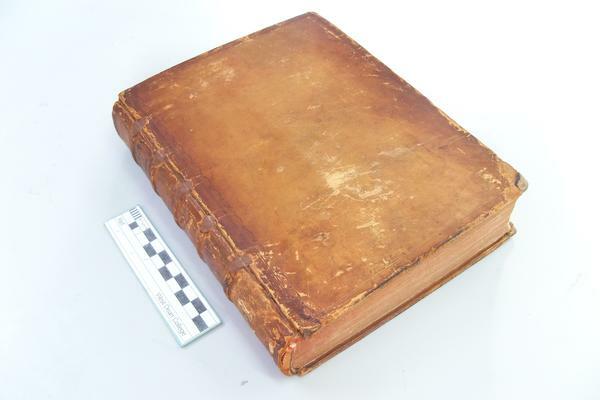 One way, a method that may be necessary on very heavy duty volumes, is to remove the spine piece as carefully as possible and work from there. However, there is a less invasive and much quicker method of board reattachment that can be carried out with only minor disturbance to the spine; this is the process of sewing cord extensions. Two variations on sewing cord extensions will be discussed here. The first is the less invasive but also weaker version of the technique. This treatment is the most efficacious when used either on relatively small volumes or as reinforcement over cords that are still partially intact. As shown in the diagram a small amount of original material needs to be removed to carry out this treatment but this has to be weighed against the damage that would be done to the spine piece if it was instead removed to allow attachment underneath it. After the leather has been removed from the ends of the bands a thread is looped around the exposed sewing cord. 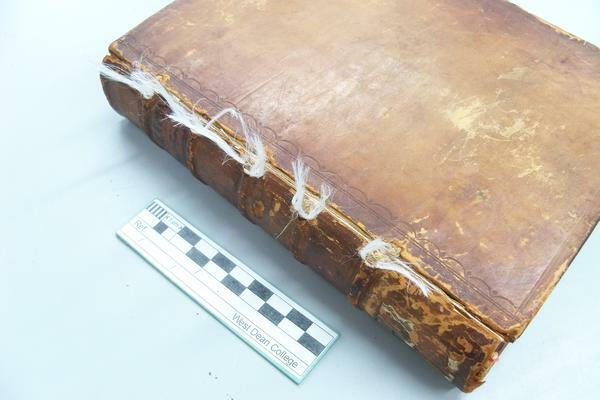 Depending on how much adhesive there is on the spine this can be tricky and may disturb the leather to either side of the cord, but this will be covered up later. After the thread is attached it needs to be frayed out and put down onto the boards. The way this is achieved will depend on whether the board is completely detached or just loose. The diagram shows the variation used for loose boards. To do this the leather on the joint edge of the board needs to be lifted so that the thread can be pasted down underneath it. 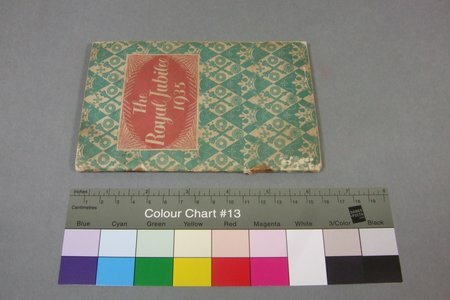 If the board is completely detached the thread could also be put down onto the inside of the board, either onto or under the endpaper. Sometimes you may wish to leave the volume with the cords exposed to better show the work that has been carried out on it but often aesthetic considerations must be taken into account. 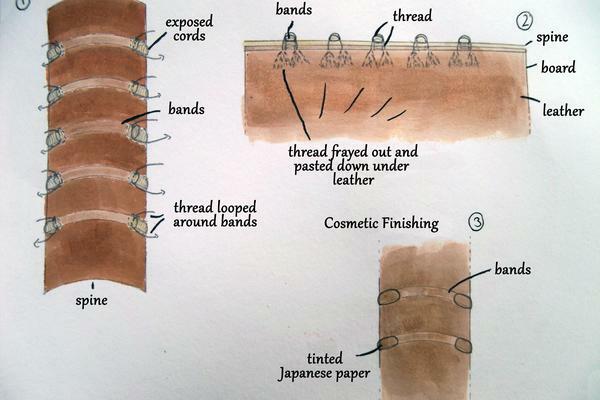 The third section of the diagram, labelled cosmetic finishing shows how the extensions may be covered up. By tinting some Japanese paper to the colour of the spine small pieces can be moulded over the exposed areas to give a neater, uniform appearance. The second variation is stronger and can provide reinforcement to a spine that is peeking or splitting in a certain place but it also requires the removal of more original material. 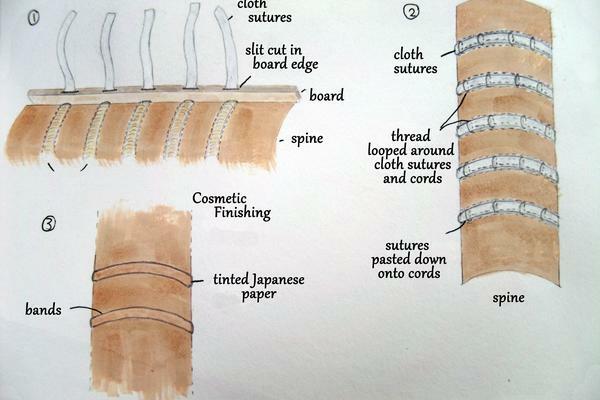 This method uses cloth sutures as well as thread to create a new attachment between the boards and the spine. To attach the sutures to the board a slit is cut into the board edge opposite the sewing cords. The cloth suture is then pasted into the slit. To make the cloth suture easier to insert it can first be pasted and left to dry to make it stiffer and less likely to fray. 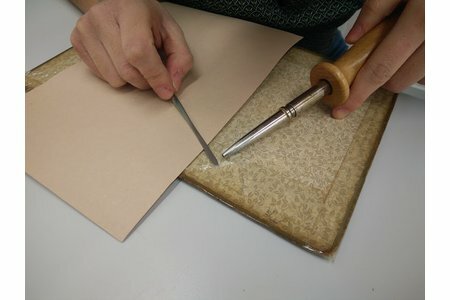 Once the sutures are in place, align the board with the book and put it in a finishing press. Remove the leather from the entire length of the bands then lay the cloth sutures out onto the exposed cords. Paste the sutures down onto the the cords then loop thread around the entire length of the cords to secure the sutures in place. In order to minimise the damage to the leather around the cords while looping the thread the leather can be lifted along the cut edges to give better access. 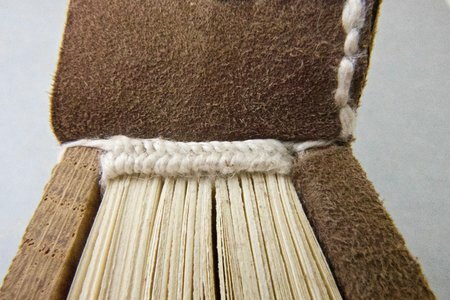 Once again Japanese paper can be tinted to an appropriate colour in order to carry out cosmetic finishing to the exposed cords. If the leather was intact enough to be lifted around all of the cords then the tinted strip can be put down underneath it and the leather pasted back down on top of it to create a neat finish.